DO YOU ALSO WANT SOME PASTA? Why is my pasta stuck to this bench? LOVING PASTA IS NOT CREEPY! 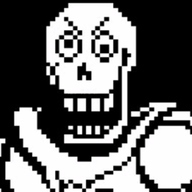 *You make a bad pun about skeletons. I WILL BECOME A PART OF THE ROYAL GUARD!